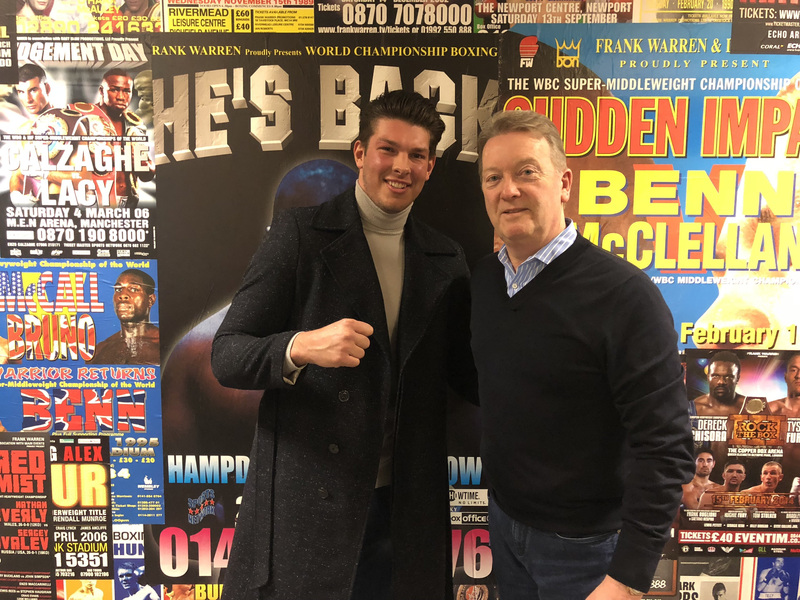 James Branch has signed a promotional deal with Frank Warren. The former Repton Boxing Club star represented Team GB on several occasions, one of the many highlights of a glistening amateur career that included 7 National Title wins and 3 GB Titles. Branch, 22 , achieved his long-time ambition when he claimed England Boxing Senior’s Elite 86kg title in April 2017 and believes his counter-punching style will help him bag more titles in the professional ranks. He will be plying his trade under the watchful eye of respected trainer Martin Bowers at the renowned Peacock Gym in Canning Town alongside Warren stablemate and Heavyweight sensation Daniel Dubois. The Hainault talent is looking forward to getting his career up-and-running in the paid code with a debut to be announced shortly, and Branch feels now is the perfect time to turn over with Hall of Famer Warren. “It’s an exciting time to be joining Frank’s stable, there’s some real talent on his books and I want to be leading the way eventually. His 2018 schedule is already looking top drawer and hopefully I’ll be able to get on a few of the big shows. “I’m looking to make my name quickly so I want to be as busy as possible in the coming months. I’ve won multiple titles at Cruiserweight and Light-Heavyweight and I’ll be sitting down with my team to decide which weight I’ll be making my debut at. “I believe that my style is suited to the professional game. I’m a slick southpaw and can cause problems for anyone on my day. Make them miss and make them pay is my motto! I’ve been training with Martin for a month or so now and he’s already made me feel part of the Peacock family. Watch James on Bunce’s Boxing Hour on BoxNation (Sky channel 437/HD 490) this evening at 7.00pm.